A fully revised and updated version of the ultimate guide to language development for parents! Language is about so much more than just words, and healthy communication is the foundation of a child’s ability to succeed emotionally, socially, and academically. The first 8 years of life represent a critical period of language and literacy development, and parents/caregivers are a child’s primary role models as he or she begins to acquire speaking, reading, and writing skills. Fully revised, Beyond Baby Talk is here to guide readers through the easiest and most engaging ways to instill strong communication skills in children and to provide fun for caregivers and children along the way. • Evaluate and monitor a child’s spoken language development. • Enhance a child’s literacy skills for improved spelling, reading, and writing abilities. • Understand and navigate environmental influences on language development such as television, texting, and slang. • Recognize the signs of language and literacy progress problems—and know when to seek professional help. What Are People Saying About Beyond Baby Talk? “In this practical guide, Apel and Masterson explain how infants, toddlers, and children learn to speak, read, and write in clear and simple language that will help parents understand and bolster their children’s progress. Along with the compelling examples that illustrate the ways in which everyday interactions promote language and literacy, the authors provide a rich array of suggestions, resources, and guidance that will empower parents to fulfill their critical role in their children’s development." 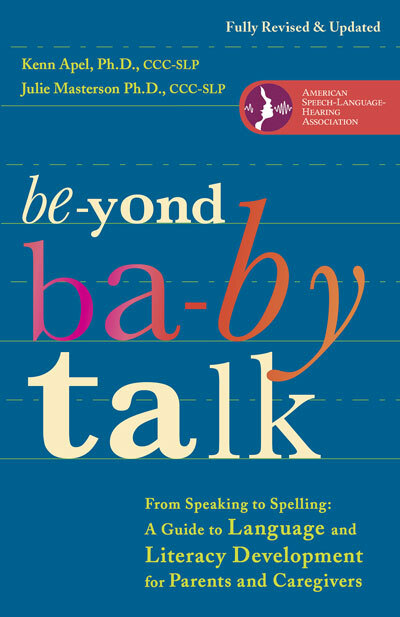 “Beyond Baby Talk combines accuracy with readability to produce an excellent resource for parents, caregivers, and clinicians alike." “As a father of two older daughters and a young son, I was especially drawn to Beyond Baby Talk’s chapter on the influence of gender and birth order on language development. I expect that I will pick this book up repeatedly as my son grows, to review important details about language and literacy development." Kenn Apel, PhD, CCC-SLP, is a professor and chair of communication sciences and disorders at the University of South Carolina and a widely known researcher and educator in language and literacy development and disorders. Julie J. Masterson, PhD, CCC-SLP, is a nationally known educator and researcher in speech, language, and literacy development. She is a professor of communication sciences and disorders at Missouri State University. The authors share why they decided to write Beyond Baby Talk.